San Francisco SPCA and Visitacion Valley Strong Families teamed up to extend family support services to pets. 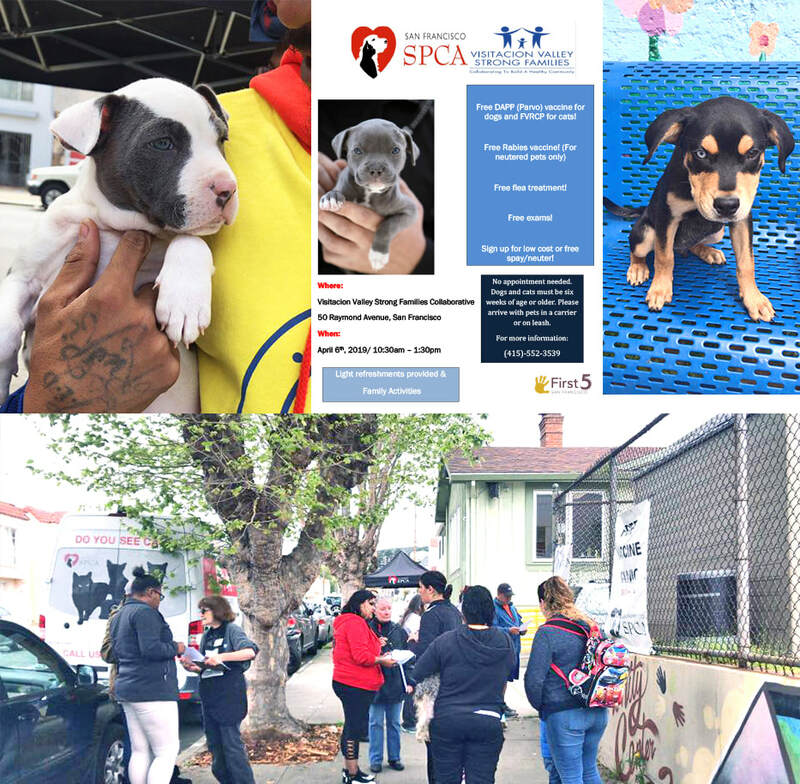 On April 6 the courtyard between our facilities at 50 and 66 Raymond Ave. became an outdoor clinic for SPCA to provide free vaccinations, flea treatment, exams for dogs and cats. During this 3-hour period, 33 families came by and we were able to service 47 pets on site; neuter/spay appointments were made for 5 pets. We hope to continue this collaboration with SFSPCA to keep building healthier, stronger families. The collaboration came about because one of the SPCA employees contacted us. He knew we had a big enclosed yard, and that we provide services for low-income families in Vis Valley and Sunnydale. SPCA's main focus is too bring down the number of Parvo cases that they see coming into the clinic. Most of the Parvo cases are coming from Bayview, Visitacion Valley, and Sunnydale. They felt ours was the perfect location to target this issue. When left untreated, the mortality rate of parvo virus infection is around 90%.